When the iPad first launched in 2010 we immediately realised this could be a game changer for the way businesses present their products and services. The immediacy of accessing a presentation on an iPad means you can very quickly pull up slides on your iPad and have a quick sales meeting / presentation informally. When the iPad launched there weren’t any presentation apps available for it. You couldn’t get Powerpoint on to an iPad and even Apple’s Keynote was very limited. Brands commissioned agencies to make them apps and often the content was static or in PDF format to flick through. Whilst this approach is fine, you lose the impact and engagement of dynamic presentations. Once the first generation iPad hit the shops in 2010 we immediately started redeveloping our Presentia presentation app to run on the iPad. Consequently we were the first independent presentation product to have an iPad presentation app in the App Store. Today there are many presentation apps out there including Haiku Deck, Prezi, and SlideShark. You can finally now get Powerpoint on there too and it performs OK.
iPad Business Presentations – who does this? We speak to many large corporate organisations when we demonstrate Presentia, and the take-up of iPads being deployed to sales teams has been slow over the last 5 years but is steadily on the increase. Many companies adopted the approach to run trials with small numbers of sales people. Others took the Bring Your Own Device (BYOD) approach but then had the headache of accessing all their internal systems and the associated security headaches that brings. Some sectors were very early adopters. We found the Medical/Pharmaceutical sector to be first to adopt iPads for presentations, closely followed by the Investment Banking community. The latter use them for pitchbook presentations getting away from huge stacks of paper handouts. In fact that’s exactly the demand that made us develop our hosting (or master/slave) functionality in our Presentia iPad presentation app. Today most corporate clients use a mixture of iPads and laptops to deliver presentations. What About Presenting on Android Tablets? When the first Android tablets emerged we waited to see what the corporate world would think of them. We did publish our Android Tablet presentation app to ensure we have full cross platform coverage for Presentia. However today our user base for Android presentations versus iPad presentations is 86% iPad against 14% Android for our Corporate Presentation Users. Android tablets seems to be most popular in the Small Business / SME market for adhoc presentations. With these few simple tips you can leave the laptop at the office and go and present on an iPad. Ensure you have a good iPad presentation app like Presentia or Keynote/Prezi/Haiku. The first thing you should do before presenting with your iPad is disable notifications. You definitely don’t want push notifications to interrupt your presentation! The easiest way to do this is to tap on Settings, Do Not Disturb, and then switch the Manual slider ON. 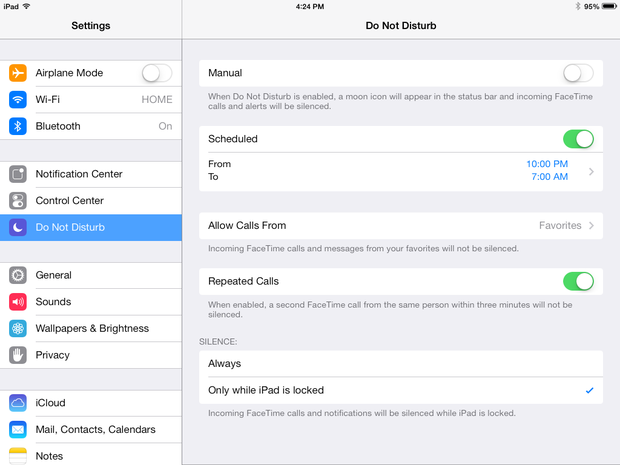 Turning on the Manual Do Not Disturb mode will stop all notifications from appearing on the iPad whilst you present. A small moon icon will appear next to the battery indicator to let you know that Do Not Disturb mode is enabled. Once you’ve finished your presentation, you can switch the Manual mode to OFF. With an iPad there are a few ways to connect your device to a projector. The main two ways are through AirPlay or a Dock/Lightning port adapter. With your iPad connected to a projector, you can easily present to an audience. AirPlay is the easiest way to get your device’s screen appearing on a projector or TV. To use AirPlay, you need an AirPlay device plugged into the screen that you’ll be using for your presentation. The best AirPlay-capable device is the Apple TV, but you can also use a Mac or PC with AirServer installed. AirPlay mirroring is a great option for displaying your screen in a presentation. Apple offers both HDMI and VGA adapters for iPads with a 30-pin Dock connector, and newer iPads utilize the Lightning port. 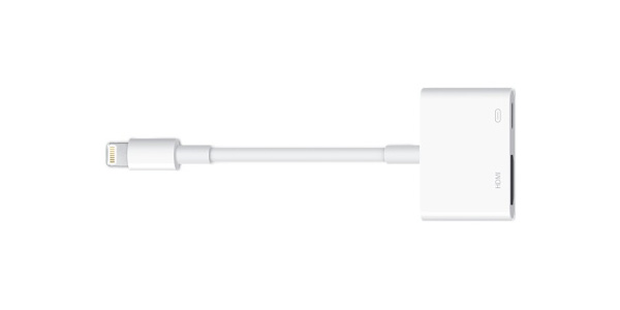 Once you’ve established a connection with one of these cables, your presentation on your iPad will instantly show up on the screen. You can easily exit your presentation temporarily by tapping the device’s home button. If you wanted to give a demo in the web browser, you could tap the home button, open Safari, give the demo, then re-open your presentation.